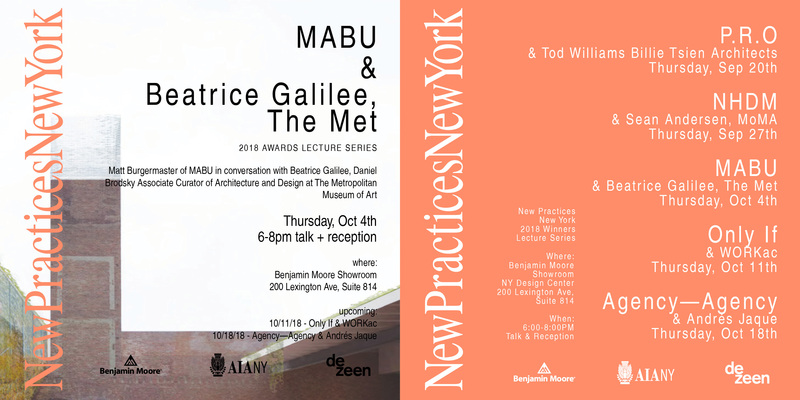 SCE faculty Matt Burgermaster will be presenting his work in a public lecture as part of the New Practices New York 2018 lecture series on Thursday, October 4th at 6:00 PM. Matt’s presentation will focus on recent design work by his office, MABU, that re-imagines traditional notions of waste, value, and change. It will include a discussion with Beatrice Galilee, the Metropolitan Museum of Art’s Associate Curator of Architecture and Design. The event will be held at the Benjamin Moore Showroom at the New York Design Center, 200 Lexington Ave., Suite 814. A reception will follow the lecture.